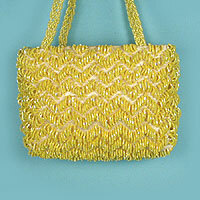 Compact beaded evening bag with in a wave design. 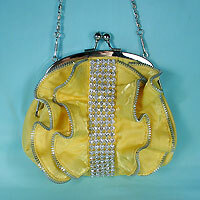 This great little evening purse is fashioned with bright beads on a satin background. The beads are a rich color with a slight iridescent sheen. It has double beaded braided handles and a shoulder cord that can be tied around the handles for extra length and convenience. It is lined in satin with a side pocket and has a secure zipper closure. It easily accommodates your keys, lipstick, cash and a cell phone. Measurements: width 6", height 4½", depth 2-1/4"